Hey everyone! I've teamed up with The Girl with the Blue Bow and a few other awesome blogs for Heather Laveaux's EP release party for 3 Octave Martini! It's my first time participating in a "blog party", so this should be fun (everyone's links and info. at the end of this post). Be sure to pop on over to everyone else's blogs for some reviews, giveaways, and more while we celebrate! Heather Laveaux has a gorgeous voice, so if you love lounge-y jazz music, give her songs a listen. "I think my music resounds with anyone who has been told to be something or someone she didn't totally agree with at one time or another,or who finds herself walking the line between independence and society's definition of "feminine and lady-like." She's the soccer mom who rocks red stilettos, the choir girl with a hidden tattoo, the life of the party who teaches kindergarten, the corporate giant in a Chanel power suit who goes commando to board meetings - because she can and she's good with that. She's anyone who has a mischievous little grin for reasons that may be known only to her." You can also win one of her EPs during the blog party (see links below), or purchase a physical copy on her website for $7 USD, and it's also available on Amazon and iTunes. I thought it would be fun to talk to Heather about her style, especially after seeing her glamorous photos on her site (so very Breakfast at Tiffany's--with a martini). I wanted to know what her everyday style was like and where she drew her inspirations from. What I learned was that she's definitely not afraid to mix things up with unexpected combinations, is inspired by Old Hollywood and pin-up girls, and loves shopping too. 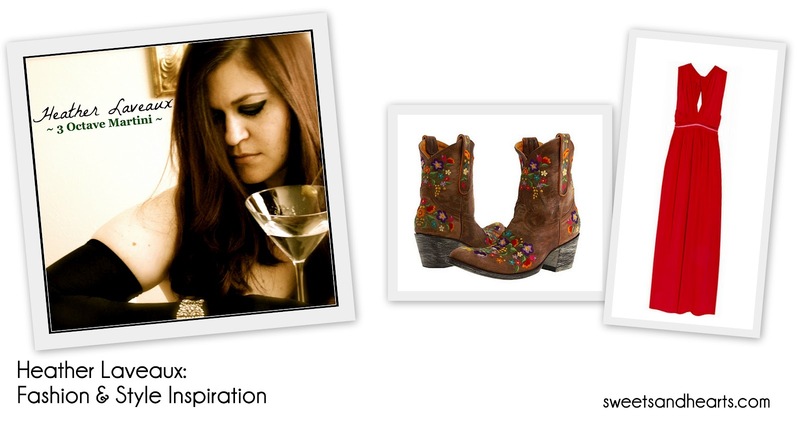 Her style: A self-described "Ginger-meets-Mary Ann", Heather isn't afraid to mix and match. "I'm not much for blending into the scenery, but I don't think that means I have to be over-the-top, either." On fashion inspirations: "I've always loved the elegance and independent attitude of Old Hollywood starlets, peppered with the innocent sensuality found in pin up art. I see both as a celebration of women. I always want to exude the look of confidence, more so than emulate the actual fashions being worn by celebrities and socialites. I'm not particularly trendy and tend to keep things for as long as they can live before retiring to fashion-Heaven (aka GoodWill or a really cute dust rag)." On shopping: "I LOVE to shop. Anywhere. Everywhere. Love it!!! I'm just as happy digging for buried treasure at discount stores or shopping online, as I am going to high-end boutiques or luxury brand stores. It's the thrill of the hunt for me. I love to shop, but if they sell shoes; I'm a VERY happy girl. GAME ON!" Heather's typical everyday outfit consists of Lucky Brand tees and jeans, but also loves dressing up a bit--with a twist of course. 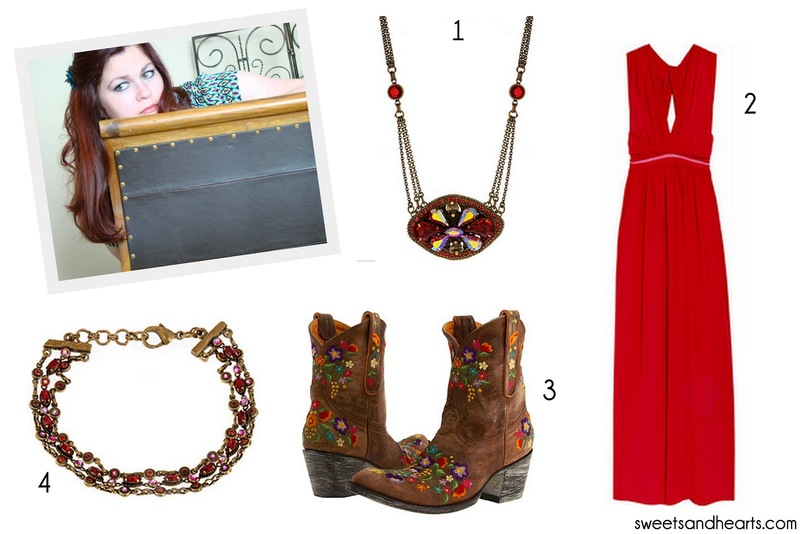 To get Heather's style, pick out your favorite Old Gringo cowboy boots (one of her obsessions) and pair it with a fancy silk gown (or perhaps a light maxi dress for summer weather). Add a jeweled Sorrelli necklace and bracelet (she loves wearing these), and pull your hair back into a sophisticated ponytail. The result is an awesome mix of Western modern glam--so very Heather! Hope you enjoyed this style inspiration post. You can follow Heather on Facebook and Twitter.